A protein kinase complex known as mTORC1 is known to control cell growth by upregulating anabolic processes and downregulating catabolism in response to growth factors and nutritional cues such as amino acids. Because mTORC1 signalling is an important driver of cancer development, we need to understand how this signalling is regulated. mTORC1 signalling occurs from lysosome membranes and is regulated by the lipid kinase PIK3C3 and its catalytic product, phosphatidylinositol 3-phosphate (PI3P), but the mechanism has remained unknown. 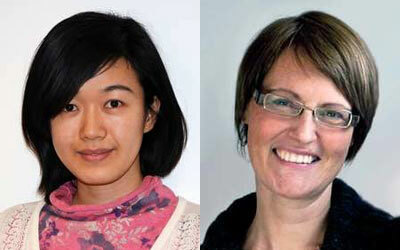 Now, postdoc Zhi Hong and her co-workers in Camilla Raiborg’s project group at the Department of Molecular Cell Biology at the Institute for Cancer Research have discovered that PIK3C3 and PI3P control mTORC1 activation by regulating lysosome positioning. When cells are stimulated with amino acids, PIK3C3 is activated to produce PI3P, and two PI3P-binding proteins, Protrudin and FYCO1, cooperate to mediate transport of lysosomes along microtubules to the cell periphery. This brings mTORC1 in proximity to growth-signalling receptors at the plasma membrane, thus priming mTORC1 for activation. These results, which are published in the Journal of Cell Biology, are interesting since they open new avenues for pharmacological targeting of metabolic signalling in cancer. The findings are published in the October 13 issue of The Journal of Cell Biology (journal impact factor 7.955). (A) Under nutrient starvation conditions, lysosomes localize perinuclearly, mTORC1 is predominantly cytosolic and VPS34 activity is low. The lack of PI3P on lysosomes prevents the PI3P-binding endoplasmic reticulum (ER) protein Protrudin to form ER-lysosome contact sites. (B) The presence of amino acids stimulates the recruitment of the mTORC1 complex to lysosomes. In addition, amino acids activate VPS34 to produce PI3P on the lysosomal membrane. The PI3P binding protein FYCO1 is recruited to lysosomes and Protrudin can mediate PtdIns3P dependent ER-lysosome contacts. In such contact sites, the microtubule motor Kinesin-1 is transferred from Protrudin to FYCO1. (C) Lysosomes loaded with Kinesin-1 are translocated along microtubules to the cell periphery. This brings the lysosomal mTORC1 complex in close apposition to nutrient signaling complexes at the plasma membrane and promotes activation of mTORC1. PtdIns3P controls mTORC1 signaling through lysosomal positioning. Hong Z, Pedersen NM, Wang L, Torgersen ML, Stenmark H, Raiborg C.